Rocco Termini is eager to see his new incubator projects on Chandler Street swimming in happy tenants. But first, he just wants to see his happy tenants swimming – at least by Memorial Day of next year. 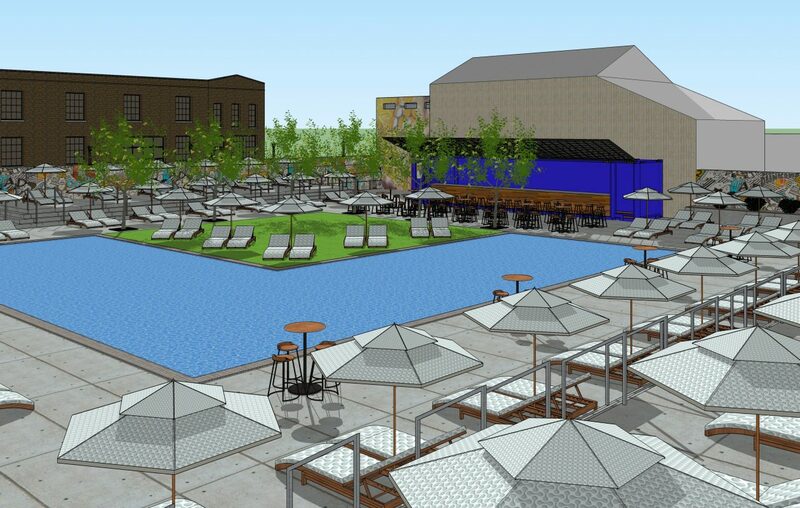 Termini, owner of Signature Development Buffalo, is working with architect Benjamin Siegel on a plan to create a pool club in the midst of the industrial and commercial block that he is redeveloping in North Buffalo. The Chandler Pool Club would be aimed at the younger clientele that are expected to frequent Tappo Pizza, Thin Man Brewery and the Buffalo Cider Hall in the adjacent buildings, as well as families that live nearby, Siegel said. Located at 140 Chandler, the club would offer both yearly memberships and day passes for anyone who wants to use it, for undetermined fees. The stand-alone club, whose cost is estimated at $1 million, would be a new and unusual addition to what is otherwise a bleak strip of industrial buildings that Termini is converting into commercial and restaurant space. "We’re trying to create a destination on Chandler Street, and I feel doing something out of the ordinary will help us make this street a destination," Termini said. "It’s been done in other cities." Those previous ventures have resulted in 160,000 square feet of space at 155 and 166 Chandler that now house a mixture of technology firms, offices, breweries, a restaurant and banquet facility, a gym and a salon. More than 700 people work in or visit those buildings, according to documents submitted to the city Preservation Board as part of a recent request to demolish an aging structure at 125 Chandler that will now be a parking lot to service tenants of the larger facilities. 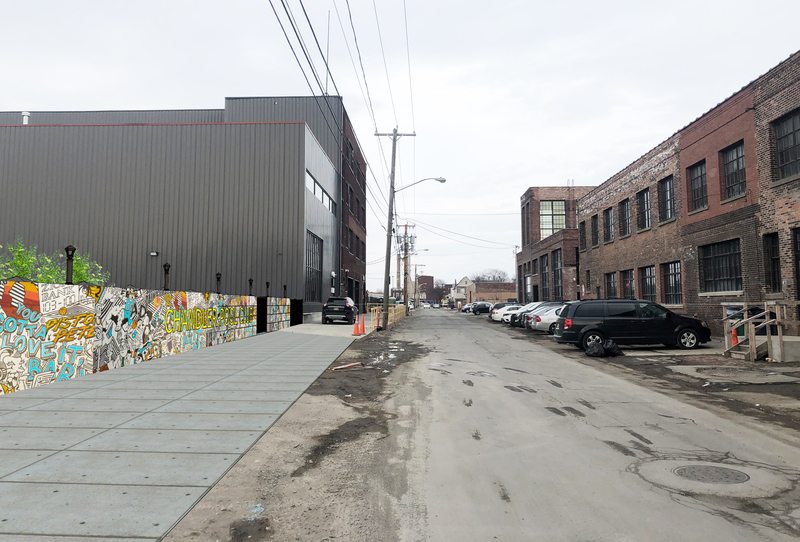 Termini is also working on a third incubator project, to transform two old warehouses at 27 and 37 Chandler into a 35,000-square-foot small business hub for about 30 food vendors and related businesses, with links to SUNY Buffalo State and the state's Start-Up NY initiative. Siegel said that Termini had originally proposed a pool as part of the courtyard at 155 Chandler, across the street, but that was nixed by the State Historic Preservation Office and National Park Service, which "wanted to maintain the industrial look." So Termini decided to move the project across the street. "It's an industrial site and we aren't trying to hide that fact. We are trying to build upon it actually," Siegel said. "We want it to feel like a lush oasis within all this industrial hardness." The pool would be limited to four or five feet in depth, Siegel said. Seating around the perimeter of the club would be raised 28 inches above the pool "so everyone has a view to the water," he said. Plans call for use of a shipping container to house a bar, with murals and graffiti decorating the surrounding eight-foot concrete walls and existing buildings nearby. Tappo Pizza would provide the food, and "we hope to have live music most days," Siegel said. Termini and Siegel are working to refine the design and finish construction documents "in the next few months before obtaining building permits and approvals from the Buffalo Sewer Authority and state Health Department. Siegel said they don't expect to need either city Planning Board or Zoning Board of Appeals approvals. They hope to break ground in March 2020 and finish by Memorial Day, in time for the summer swimming season.